Webb was widely smeared by the CIA’s favorite newspapers (The New York Times, the Washington Post, The LA Times ) shortly after this interview. An Israeli settler opened fire on Sunday outside two schools in the West Bank, as other settlers rampaged through the street under the protection of Israeli forces, reports Wafa News Agency. The schools are at the entrance to the village of al-Lubban al-Sharqiya, to the south of Nablus in the West Bank. The shooting terrified the students and teachers of the two schools, and were forced to leave the schools to a safe haven. Ibrahim Emran, the principal at one of the schools, told Wafa that settlers from the illegal Israeli settlement of Yitzhar attacked the school under the protection of the Israeli military, and that one of the settlers shot a bullet in the air to terrify the students. Emran said the school was forced to evacuate its students to keep them safe. He added that the settlers also attacked civilian homes near the school, while soldiers fired rubber-coated bullets and gas bombs, prompting clashes between soldiers and local citizens. Israeli sources claimed that the firing came in a response to a stoning attack on settlers’ vehicles passing at route 60, just near the entrance to the village where the schools are located. The operation “Northern Shield” was launched with great fanfare by the Israeli occupier on December 4, allegedly aimed at “exposing and neutralizing the cross-border attack tunnels that Hezbollah dug from Lebanon to Israel”. Indeed, the Lebanese Resistance has repeatedly promised to no longer be on a defensive position in case of aggression or war, and carry the fighting inside occupied Palestine, or even to liberate Galilee. Spokesmen of the Israeli government ostensibly congratulated themselves on what they presented as thwarting the plans of the dreaded Hassan Nasrallah. Israeli propaganda and its docile Western media relays presented the operation as a large-scale military offensive that would strike a huge blow to the Party of God, as if the Zionist entity had entered Lebanese territory (or was about to do so), whether on land or underground. A speech by the Hezbollah Secretary General was announced for the same day by the Israeli and Western media, which would have seemed to confirm the importance of the Israeli operation. And given Hezbollah’s silence, it was ultimately said that this silence was due to the shock in which the Lebanese Resistance found itself after this surprise operation that would have ruined its most secret plans. This is where Israel is frightened and terrified. Because what Hezbollah does in Syria, if a war is launched against it, it will do it in Galilee. […] If Hezbollah emerged from the (2006) July war as a regional power, it will emerge from this war (in Syria) as a true military power representing a force capable to liberate (huge) territories not only through guerrilla warfare, but even in a war that looks much more like the classic wars (between national armies). We are not now in a situation where our soldiers are behind enemy lines. We are talking about engineering activity within the sovereign territory of the state of Israel. Netanyahu is blowing the incident out of proportion. He made a defensive engineering event into a dramatic military operation. This was done for one of two reasons — either the Prime Minister is himself panicking, or he wants to sow panic to justify his actions both in delaying elections and abandoning the residents of southern Israel [against the rockets of Gaza]. More weak than ever, Netanyahu wants to present himself as a strong man against Hezbollah, but the operation launched against alleged tunnels, a preposterous maneuver to divert the attention of the Israeli press and public opinion, reveals only the powerlessness of Israel against the Party of God. Hezbollah is well aware that Netanyahu will not dare to launch a war of aggression against Lebanon, and that against Hezbollah, Israel has no other recourse than Washington’s sanctions and its own appeals to international institutions –these same institutions and laws trampled on by Tel Aviv for decades– to condemn the alleged violations of Israeli sovereignty by Hezbollah –while Israel continues to violate Lebanese airspace daily– and take action against him. In the face of such childishness –the Israeli army is more likely to find Digletts and other underground Pokemon than operational tunnels of Hezbollah–, Hassan Nasrallah was wary not to provide any fuel to Netanyahu’s show: any speech on his part would have added credibility to this hyped pseudo-operation. Hezbollah media and Lebanese civilians took care of responding, widely ridiculing the operation, mocking Israel on social media, and picnicking with family on the border to taunt Israeli soldiers on the war footing. A clip called “We’ll meet up in Haifa”, subtitled in Hebrew, was directed by a Lebanese artist, parodying an Israeli song. Hezbollah fighters can be seen reaching Haifa by tunnel, and spying on Netanyahu in his own home. 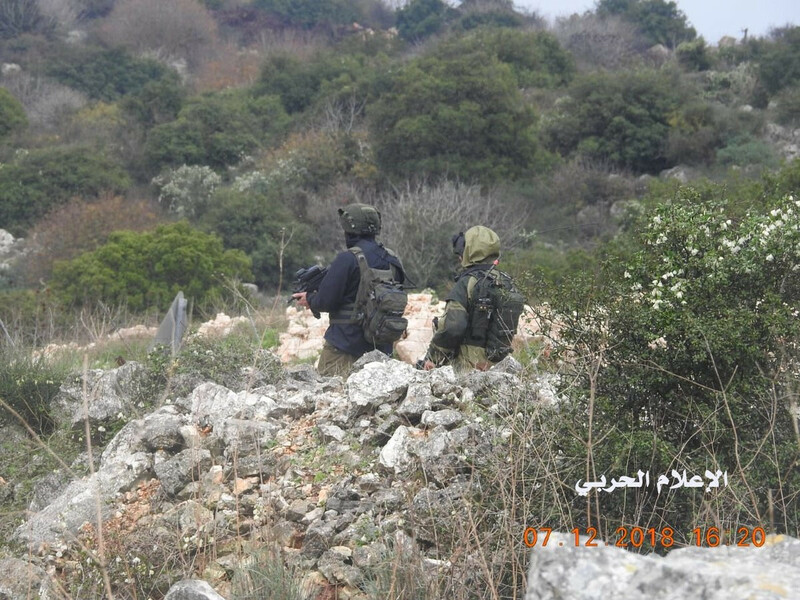 For its part, Hezbollah’s war media published a picture of Israeli troops taken from behind, inside Israeli territory, while they were facing the Lebanese border, thus proving that even when the enemy is on high alert, its territory remains easily accessible. The other NDP member on CIIG’s executive also recently departed from the party’s position by condemning the Palestinian solidarity movement. Randall Garrison tweeted, “Nick Cave: cultural boycott of Israel is ‘cowardly and shameful’” and linked to an article quoting the Australian musician who has joined a growing list of prominent individuals – from Lorde to Natalie Portman – refusing to whitewash Israeli apartheid. Recently, the White House hosted two Hanukkah celebrations attended by the president, first lady, and vice president. One can imagine the general bonhomie as the Trumps rubbed elbows with fellow billionaire Sheldon Adelson and other luminaries of the ‘special relationship’. Trump was cheered for his provocative move of the American embassy from Tel Aviv to Jerusalem, something many observers call a sea change in U.S. foreign policy. Of course, almost every recent president has publicly stated that Jerusalem is Israel’s proper capital. Trump was simply the first president to actually follow through on the implications of that position. This latter belief has been lately exploded by several excellent books, among them Rashid Khalidi’s Brokers of Deceit. Thanks in large part to such works, the rise of social media, and the militancy and visibility of the Boycott, Divestment, and Sanctions (BDS) movement, the general tenor of debate in the United States, at least, has changed. This is deeply troubling for Tel Aviv and Washington, which have long depended on a tightly controlled, top-down narrative to control opinion on Palestinian issues, a storyline dutifully disseminated by sycophantic corporate media. But a false narrative cannot survive or thrive amid a digital space of unbridled debate, much of it agitated unmediated wrangling with a tendency to devolve into ad hominem attacks, but also plenty of powerful non-mainstream journalism bringing fresh perspectives to the topic. Only heavy-handed censorship can hope to stem the tide of dissident voices from chopping the legs out from beneath the mainstream fairy tale of Israeli rectitude and Arab savagery. And that is, of course, precisely what is happening in the social space. Facebook has purged some 400 pro-Palestinian voices from its platform for violating “community standards,” an ironic phrase given that real community standards would necessarily have to be created by the community, rather than its ‘owner’, presently being advised by the neoliberal, neocon Atlantic Council. Facebook labeled the banned commentary as “hate speech”, a term unsupported by the Supreme Court but happily flung about by the Israeli lobby–alongside the stalwart ‘anti-Semitism’–in efforts to shutter dissent. Twitter, too, has fallen in line with the pro-Israel position of both the government and its mainstream media lapdogs. It has shuttered attempts to out IDF commando unit soldiers who raided Gaza last month. The censorship aligns with Israeli military censors in Tel Aviv. CNN wasted no time firing Marc Lamont Hill after a fairly normal speech at the United Nations during its commemoration of the International Day of Solidarity with the Palestinian People. Board members at Temple University, where he teaches, rumbled about punitive measures. The treatment of Hill falls in line with a long history of attacks on African-Americans who disagree with American foreign policy, from Paul Robeson during the McCarthy era, the many victims of the FBI’s COINTELPRO effort to destroy black solidarity movements. Even Andrew Young, serving as Jimmy Carter’s UN Ambassador, was forced to resign when he took the bold step of actually talking to the Palestinian Liberation Organization (PLO). An alliance of oppressed peoples across national borders is a true existential nightmare for imperialists, explaining in part why so many African-American leftists have been swift and energetically besieged by establishment agencies. A University of Maryland poll of Americans showed growing support for a one-state solution, as more observers have come to believe that rampant Israeli settlement-building in occupied territory have made a two-state solution completely unrealistic apart from some construction that posited a Palestinian state composed of tiny isolated cantons vigilantly policed by the IDF on the least arable land available (the rest having been annexed by entitled settlers). Americans also increasingly support sanctions on Israel for its continued settlement activity. This undoubtedly partly owing to the aforementioned thaw in the commentary, particularly of the non-professional variety, but also perhaps has to do with the fact that Washington has leveled sanctions against so many perceived foes in recent years: Venezuela, Nicaragua, Russia, China, Syria, Iran, and on and on. Why, the public must wonder, is Israel left out of this seemingly indiscriminate use of economic leverage? Zionists have mounted vigorous resistance to BDS, and have persuaded Congress to put forward the Israel Anti-Boycott Act, which would criminalize any kind of voluntary boycotting of Israel and its settlements. This last argument reflects the threadbare smear that pro-Israeli hawks like Alan Dershowitz and other informally appointed paladins of the cause have long used to defend criticism of Israel: that any criticism of Israel or Zionism is a de facto attack on Jews and therefore anti-Semitic. This attempt to conflate Israel with all Jewry is not unlike the facile use of the “hate speech” to encompass all varieties of criticism. Colonel Martin’s bio includes his service as the Senior Antiterrorism Officer for all Coalition Forces in Iraq and Commander of Camp Ashraf, which is where the military arm of the Mojahedin e Khalq (MEK) terrorist group was camped while Saddam Hussein was still in power. MEK, consisting of Iranian dissidents, was being used by Saddam to carry out low-intensity warfare against Iran. It was placed under American military protection after the fall of Baghdad in 2003. Colonel Martin is inevitably a harsh critic of President Barack Obama, mentioning in passing that “Unfortunately, the State Department policy under the Obama administration was intent on appeasing the Iran regime.” It is an assertion for which there is scant evidence apart from Obama’s clearly expressed reasonable desire to negotiate an end to any possible Iranian nuclear weapons program. In fact, Obama’s Secretary of State Hillary Clinton removed the group from the State Department terror list in 2012, and then arranged for its relocation to a safe site in Albania, where it still resides. In another article on “evil” Iran, obviously an obsession with Martin, he states that “The fundamentalists in Tehran were almost overthrown during the vast national uprisings of 2009 (predating the Arab Spring). While former President Obama and former Secretary Clinton stayed silent, in favor of their nuclear deal with the regime…” Martin is dead wrong that the regime was almost overthrown. It was never threatened. And, of course, it would have been difficult for Obama to have remained silent in 2009 over the “nuclear deal” which was not signed until 2015. That Iran is the leading state sponsor of terrorism is often asserted by folks like Colonel Martin and John Bolton but rarely elaborated on, particularly given the fact that the United States operates worldwide with intelligence officers, special ops and drones that kill lots of people on a regular basis without any declarations of war. Who has Iran killed lately? And when it comes to propaganda, no one does it better or more aggressively that the U.S. and Israel, even if no one believes any of it anymore.